Renault's 1st-generation Duster arrived in South Africa fairly late in its model life, but nevertheless won over several local car buyers with its high-value offering. Now, its replacement – the all-new Duster – has gone on sale, replete with more modern, refined looks and a similar price positioning – surely that's a recipe for continued success? 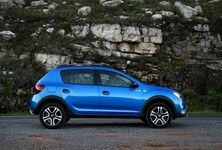 Some Renault dealers regularly offer specials: Have look here. Still recognisable as a Duster, but significantly more upmarket in overall appearance. The ever-expanding (yet still-quite-new) compact family car/crossover segment has become quite fragmented. 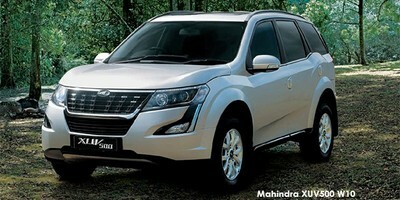 On the one hand, there are traditional offerings such as Ford's EcoSport and the fast-selling Hyundai Creta, which are good examples of vehicles that find favour with families by virtue of a combination of all-round ability and a respectable cache of luxury features. On the other hand, there are more niche offerings such as the Mazda CX-3 and Toyota C-HR, which major in style and desirability. And then you have a vehicle such as the Renault Duster, a spacious, seemingly rugged do-all that has notched up thousands of sales in South Africa. The key to its success is simple – value for money. With the 1st-generation Duster, this value for money was coupled with fit and finish that was somewhat "rough around the edges", but, at first glance, its successor appears to have taken a significant step forward, yet doesn't cost much more. Does that mean the Duster can compete even more effectively in this cut-throat segment? Is it now a viable alternative to those previously-mentioned and pricier offerings from Hyundai, Ford etc.? Now that looks neat, doesn't it? Optional leather upholstery could be a good investment. While the new Duster rides on the same platform as the outgoing car, you wouldn't say so by looking at it. All the sheetmetal is new, and it has a more confident, broad-shouldered stance than before. The exterior detailing is quite exceptional for such an affordable car – the 17-inch alloy wheels are expensive-looking, there are LED daytime running lights and satin silver accents on the skid plates, side mirrors and roof rails. At the rear, the light clusters look like they've been pinched from a Jeep Renegade. Overall, it's a car that looks considerably more expensive than it is. The biggest step forward, however, has happened inside. The previous car's touchscreen system was mounted too low on the fascia, and the rest of the controls appeared to be scattered randomly around the cabin. The new Duster's cabin looks almost Germanic by comparison... the touchscreen system, which will be Apple CarPlay and Android Auto compatible from next year (2019), is better positioned and the main controls lined up in a neat row underneath it. The ventilation system's rotary controls look like they've been taken out of nothing less than an Audi TT and even include digital displays. Finally, the steering wheel (now rake and reach adjustable) is a neat, leather-wrapped item that is nice to hold. There are various storage solutions dotted around the cabin and overall the Duster is a great fit for family holiday use. The large luggage bay is shaped to accept big items, and the rear seats fold down too. 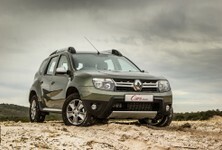 The new Duster rides on the same platform as its predecessor. It's not often that one hears of such a development, but according to Renault, the previous car's size and packaging was already spot-on (at least according to the feedback of owners, who only wanted greater refinement and a modernised fascia). Not having to engineer an all-new platform has undoubtedly also helped Renault to price this car so competitively. So, in terms of spaciousness, the news is much the same as before, which means it is good... very good. The load bay is capacious (478 litres) and of course, the rear seats can be folded down (in a 1/3-2/3 configuration). The spare wheel is underneath the vehicle's body. Rear passengers get slightly more legroom than before, and there are various storage spaces dotted in the cabin, including a tray underneath the front passenger seat. A comprehensive trip computer is fitted and this variant also features keyless start. This Duster derivative is powered by the same, long-serving 1.5-litre turbodiesel engine as before, which is coupled with a 6-speed dual-clutch (automatic) transmission. It comes as no surprise, then, that the performance and overall feel from the drivetrain are much the same as before. We'll dig into the Duster's performance later, but, for now, we'd like to comment on the fuel consumption. Given the financial pressure on consumers, low running costs are vitally important and, in that regard, the Duster excels. Renault claims a consumption figure of 4.8 L/100 km, and we achieved a real-world average of only around 5.6 L/100 km, which is exceptional. This should allow you to travel nearly 900 km on a single (50-litre) tank. Neat, ergonomically efficient and nicely detailed cabin is a vast improvement on its predecessor. This flagship Prestige-badged variant is loaded with a comprehensive line-up of features. That touchscreen system may not yet offer Apple CarPlay and Android Auto (to reiterate, that's coming in 2019), but it already offers satellite navigation and doubles as the display for the multi-camera exterior view system (front, rear and sides). You also get rear park assist, blind spot monitoring and cruise control, among other niceties. On the safety side, we would have liked to see more airbags (only driver and front passenger units are offered at present), but at least the Duster offers stability control. 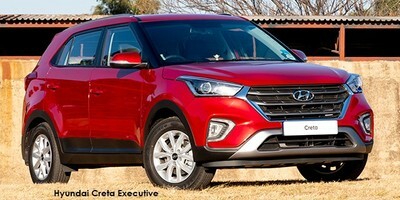 The latter feature remains notably absent from the fast-selling Hyundai Creta, for example. Neat 17-inch wheels and good attention to detailing on the exterior make the Duster look more expensive than it is. As mentioned before, the 1.5-litre turbodiesel isn't the most modern unit around, but it's proven and efficient. Also, its fitment undoubtedly keeps overall vehicle cost down. The 6-speed dual-clutch transmission has been further refined and, as long as you're not in a hurry, it generally provides well-timed shifts. But for some buyers, and especially within the context of improvements to other parts of the Duster, the engine/transmission combo's laggy behaviour is frustrating. There's some turbo lag near the bottom of the rev range, and not much power at higher engine speeds, so the torque band is quite narrow. 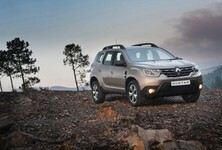 Couple this with a transmission that can be too hesitant and the Duster can feel flat-footed in certain instances. So, the Duster is not a vehicle to be hurried and is better suited to relaxed, efficient holiday touring than cut-and-thrust city driving. Mirroring the drivetrain's "relaxed" nature is the suspension set-up. There's plenty of roll in the corners, but the ride quality is supple on various surfaces (including gravel). It's a car for real-world family use, not mountain pass blitzes! Also keep in mind that a very usable 210 mm of ground clearance is on offer. The flagship Duster 1.5 dCi Prestige EDC, as tested here, sells for R334 900. It comes backed with a 5-year/150 000 km warranty and a 3-year/45 000 km service plan. It requires servicing every 15 000 km or 12 months, whichever comes first. Rear lights look similar to those on Jeep Renegade. The Duster's overall look is far more modern and coherent. 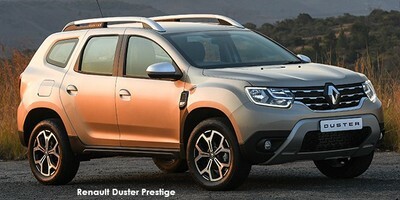 Be that as it may, from whatever angle you look at the Duster, its value-for-money offering appears unrivalled. Coupled with that, the newcomer offers a significantly improved cabin that no longer looks low-rent, and from the outside, the Renault appears more expensive than it really is. Practical, spacious and impressively fuel-efficient, the Duster appears to tick all the boxes for the modern family shopping on a tight budget and, if you looking for a sweetener, the long warranty adds considerable peace of mind. 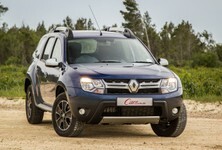 Looking for a new / used Renault Duster to buy?